READERS, PLEASE NOTE: THIS WILL BE THE FINAL POST AT THIS ADDRESS. 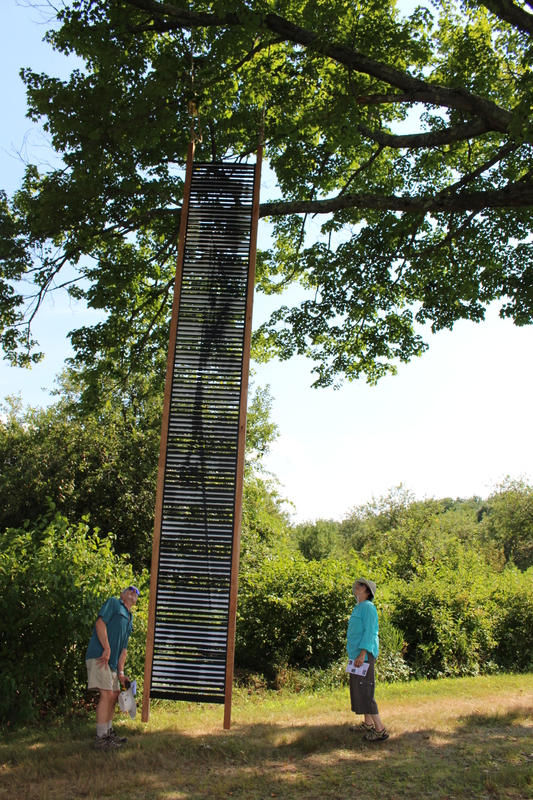 BEGINNING SEPTEMBER 30, 2015, VISIT THE WEBLOG AT New England Apples weblog. THANK YOU. PEOPLE MAY DIFFER on how to pronounce it, but there is nearly universal agreement that Macoun is one of the best tasting apples. Whether you say “Mac-cow-n” or “Mac-coo-n,” the apple named for Canadian pomologist W. T. Macoun is renowned for its crispness and sweet-tart flavor. Macoun is a cross of McIntosh with the heirloom apple Jersey Black. Also called Black Apple because of its deep color, Jersey Black supplies Macoun’s rich, wine-red tones, with occasional green patches or stripes. Macoun is a tactile pleasure, as pleasing to hold as it is to behold. Its irregular, boxy shape — another feature of Jersey Black — fits easily into the hand. Its light green flesh is crisp and juicy. McIntosh supplies much of Macoun’s juiciness and flavor, which is more tart than sweet. 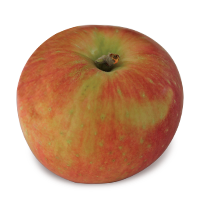 But Macoun’s texture is firmer than McIntosh, and it has a distinctive, complex spiciness, with a hint of strawberry. New England Macouns are ripe now at most orchards, and they should be available at farm stands and in stores for several months, while supplies last. For a long time Macoun was considered strictly a fall apple, which heightened anticipation of its arrival. Much of that anticipation remains today, and despite improvements in storage, demand for fresh Macouns remains strong. Macoun is such a great fresh-eating apple that it is often overlooked for cooking. It can get a little juicy when cooked, but its flavor and firmness work well in pies, crisp, and sauce, especially in combination with other varieties. As for pronunciation, there is no definitive answer. Descendants of W. T. Macoun pronounced the family name “Mac-cow-n,” but some dictionaries assert that it is “Mac-coo-n,” instead. The disparity over pronunciation undoubtedly has its origins among clans in the United Kingdom, long before the discovery of the Macoun apple in New York in 1909. It was released commercially in 1923. Over time, both pronunciations generally have been accepted, and their usage now varies some from region to region, even orchard to orchard. Named in honor of the apple scientist William Tyrell Macoun, in our opinion the “Mac-cow-n” affirmed by his descendants seems like the obvious name for this stellar treat. But once you sink your teeth into a fresh Macoun, what you call it is irrelevant. 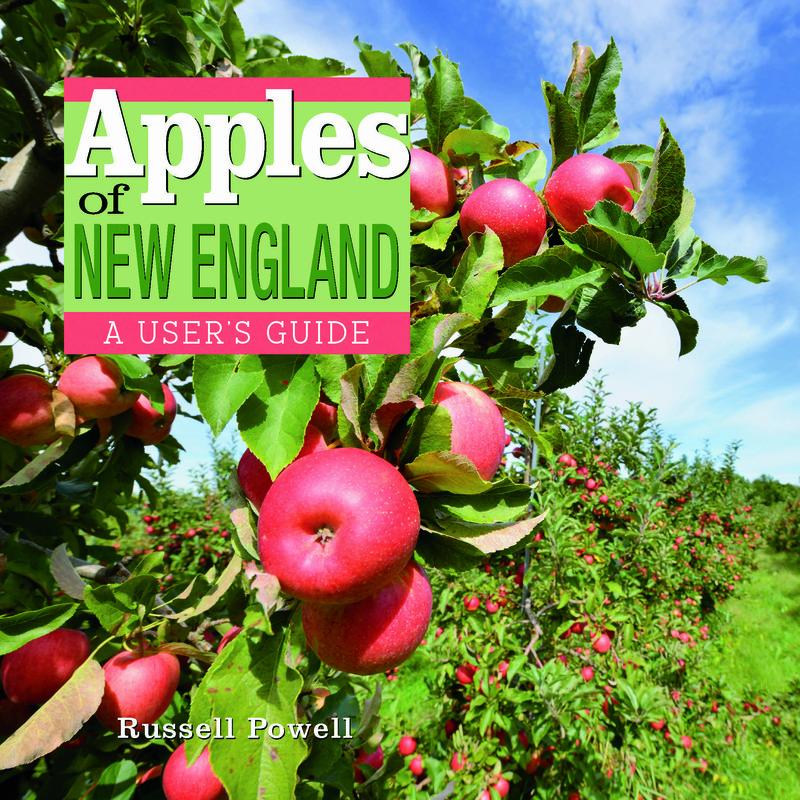 TWO BOOKS by Russell Steven Powell, senior writer, and Bar Lois Weeks, executive director of the New England Apple Association, explore the history of apple growing in the region and look at the nation’s apple industry. Apples of New England (Countryman Press) is an indispensable resource for anyone searching for apples in New England orchards, farm stands, or grocery stores — or trying to identify an apple tree in their own backyard. The book contains color photographs by Weeks and descriptions of more than 200 apples discovered, grown, or sold in New England, accompanied by notes about flavor and texture, history, ripening time, storage quality, and best use. 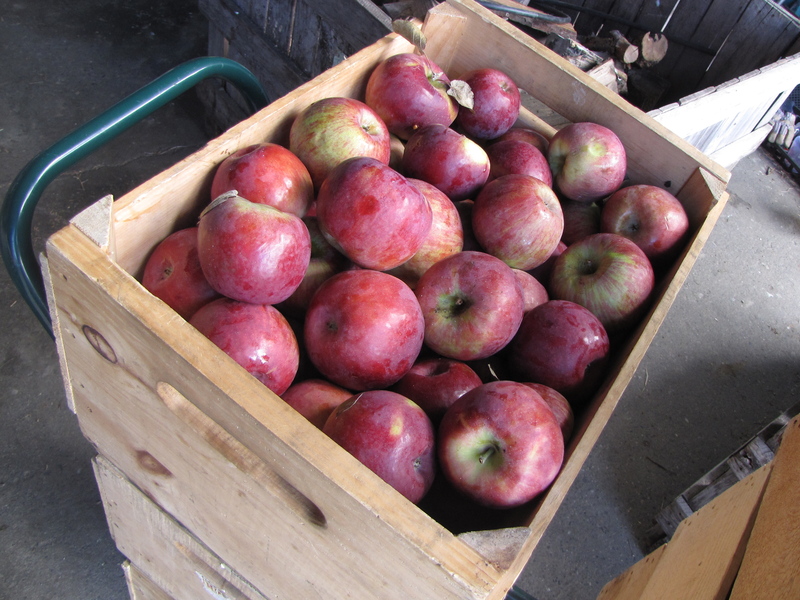 Apples of New England offers practical advice about rare heirlooms and newly discovered apples. Apples of New England includes chapters on the rich tradition of apple growing in New England, and on the “fathers” of American apples, Massachusetts natives John Chapman (“Johnny Appleseed”) and Henry David Thoreau. Apples of New England presents the apple in all its splendor: as a biological wonder, as a super food, as a work of art, and as a cultural icon. America’s Apple (Brook Hollow Press) tells a rich and detailed story about apple growing in America, from horticulture to history to culinary uses. Powell writes about the best ways to eat, drink, and cook with apples. He describes the orchard’s beauty and introduces readers to some of the family farms where apples are grown today, many of them spanning generations. America’s Apple looks at how America’s orchards are changing as a result of the trend toward intensive planting and the trademarking of new varieties, and what that means to consumers. Powell also writes about the fragile underpinnings of modern agriculture: the honeybees needed to pollinate the crop and the labor required to pick it, plus new and exotic pests and increasingly volatile weather. 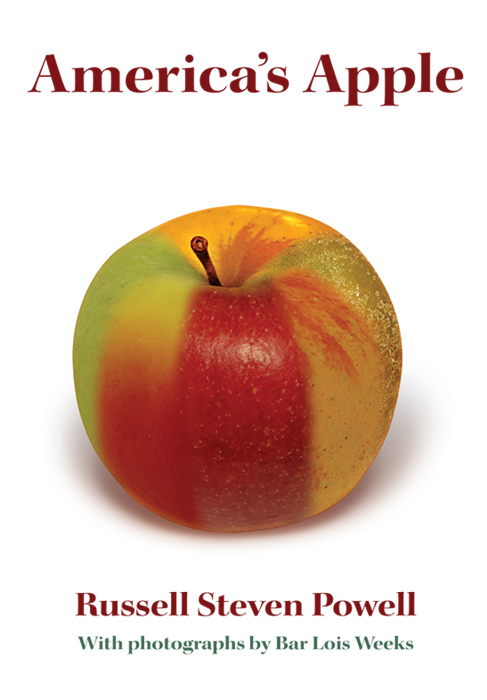 Apples of New England and America’s Apple are available in hardcover at fine bookstores and orchards and online. America’s Apple is also available in paperback. For more information, write to newenglandapples@verizon.net. Introducing the new logo of the New England Apple Association. TODAY MARKS the official kickoff of the 2015 New England apple harvest. New Hampshire Governor Maggie Hassan will bite into an apple at Mack’s Orchard in Londonderry Wednesday, September 2, at 3 p.m. Among those attending will be New Hampshire Commissioner of Agriculture Lorraine Merrill, Jim Bair, president of USApple, and Bar Lois Weeks, executive director of the New England Apple Association. Thursday morning at 9, Massachusetts Commissioner of Agriculture John Lebeaux will join Bair, Weeks, and other officials at J. P. Sullivan Co. in Ayer for a tour of the company’s new packing line, followed by a visit to nearby Fairview Orchards. J. P. Sullivan is the largest packer and shipper of apples in the region. Events celebrating the new season will be held in the other New England states throughout the month. While a number of early season apple varieties were picked in August, September is when many of New England’s leading varieties ripen. McIntosh, New England’s most popular apple, is already being picked in some orchards, and should be widely available over the next seven to 10 days. Cortland, Gala, Honeycrisp, and others will soon follow, with late-season apples available for picking through much of October. As always, call ahead to make sure that the variety you are looking for is available. TODAY ALSO BEGINS the nonprofit New England Apple Association’s 80th year. Founded by a group of growers from New England and New York in 1935, the organization became known as the Northeast McIntosh Growers Association in 1993. The name eventually was shortened to New England Apple Association. The Association promotes the New England apple industry through educational and promotional events and projects. 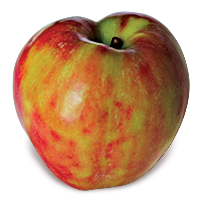 Its website introduces visitors to the wide variety of New England apples and orchards, the nutritional value of apples, and how apples are grown and prepared. In recognition of its anniversary year, the Association today introduces a new logo, designed by Christopher Rob Weeks. Tomorrow we will post photos from today’s events and launch the association’s new website! TWO RECENT BOOKS by Russell Steven Powell, senior writer, and Bar Lois Weeks, executive director of the New England Apple Association, explore the history of apple growing in the region and look at the nation’s apple industry. EARLY SEASON APPLES have come a long way in the past 50 years. Today, there are a number of excellent choices to satisfy people’s palettes as they await the arrival of the traditional fall apples like McIntosh and Cortland. Akane (ah-KAH-neh) was discovered in Japan in 1937, but it was not released commercially until 1970. It has beautiful red color with occasional yellow streaks, and sweet-tart flavor with hints of strawberry. Crisp and juicy, Akane is good for both eating and cooking, as it holds it shape well. 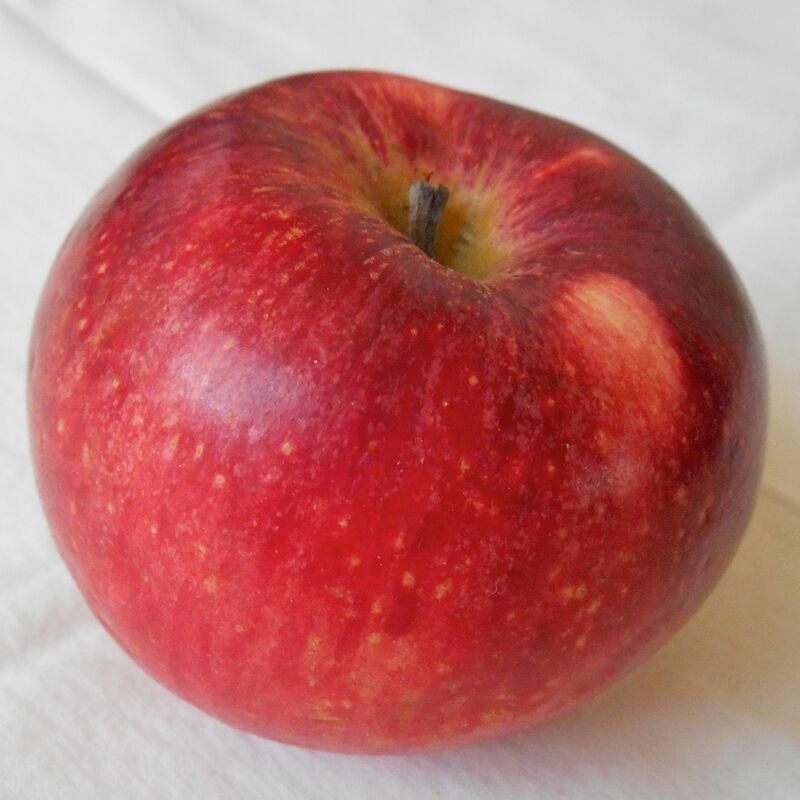 Akane is the result of a cross between two heirloom varieties: Jonathan, which supplies Akane’s rich red color, and Worcester Pearmain, which contributes its strawberry flavor. 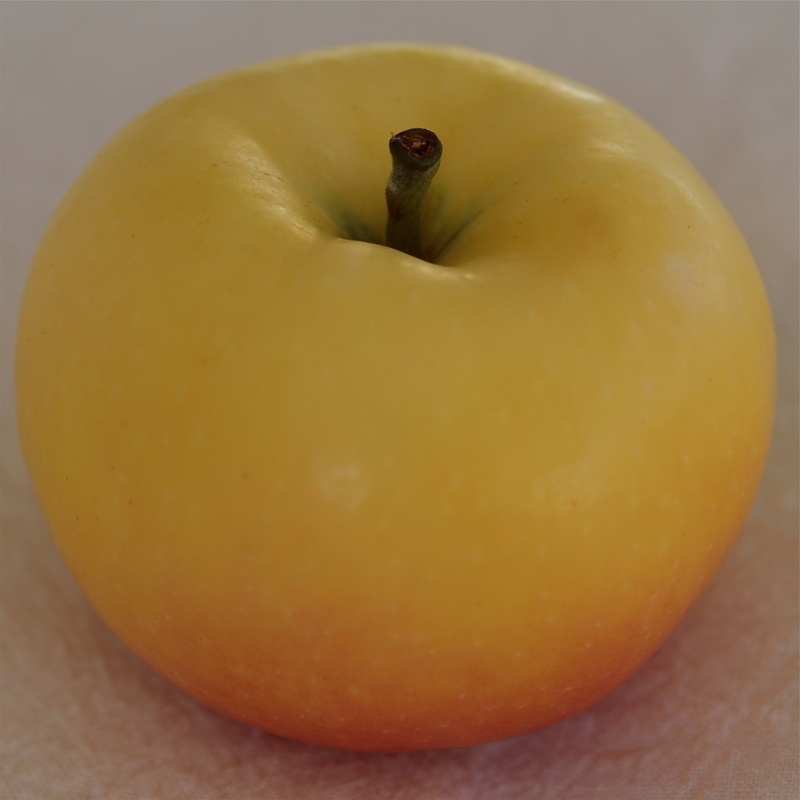 Ginger Gold was discovered as a chance seedling at a Virginia orchard in 1969; based on its characteristics and where it was found, it may be a cross between Golden Delicious and Newtown Pippin. It has yellow-green skin and is crisp and juicy. Ginger Gold’s flavor is more sweet than tart. It is good for both cooking and fresh eating, and its flesh browns slowly when sliced, making it especially good in salads. Pristine was developed at Purdue University in Indiana in 1975, and released commercially in 1994. Yellow with an occasional pink blush, Pristine’s sweet-tart flavor has hints of citrus. It is crisper and stores better than many early season varieties. 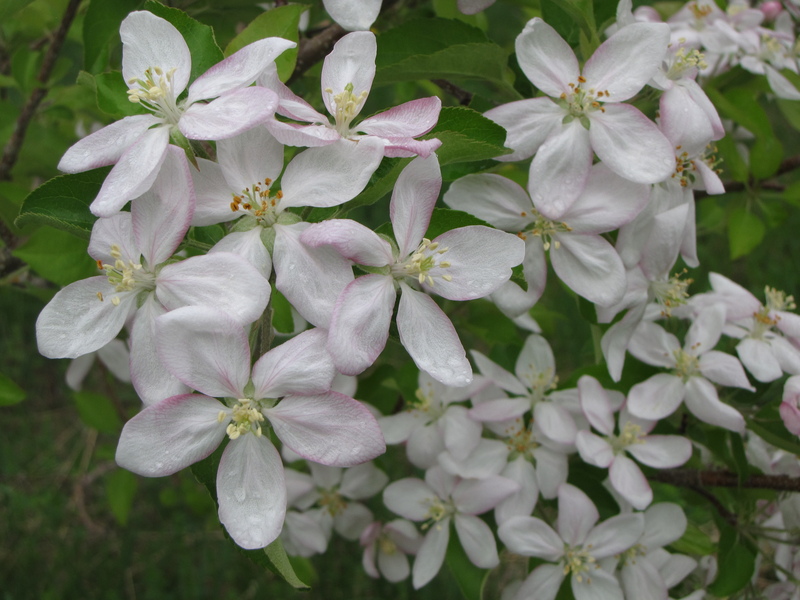 Its parentage is obscure, a cross between an unnamed seedling and Camuzat, a little-known apple from Spain. 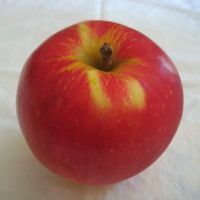 Sansa is another red apple with yellow streaking, although it sometimes can be deep pink. It is the product of a 1970 collaboration between researchers in Japan and New Zealand, and it was released commercially in 1988. It is sweet and juicy, with just a little tang, and it is considered best for fresh eating. Sansa is a cross between, Akane, which contributes to its red color, and Gala, which lends it sweetness. 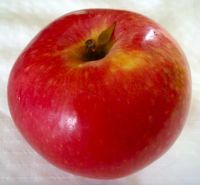 Williams’ Pride is another apple developed at Purdue’s joint apple-breeding program with Rutgers University in New Jersey and the University of Illinois. It was discovered in 1975 and released commercially in 1988. Maroon red, it is crisp and juicy, with a spicy, sweet-tart taste. It is considered a good all-purpose apple and is especially good for fresh eating. Williams’ Pride is the result of a complex cross that includes Jonathan, Melba, Mollie’s Delicious, and Rome. Zestar! is the newest of this early bunch, developed in 1999 at the University of Minnesota. It is mostly red in color over a yellow base. Crisp and juicy, its flavor is more sweet than tart. A good all-purpose apple, Zestar! is the trademarked name for the variety, which resulted from a cross of an unknown seedling with State Fair, a little-known apple native to Minnesota. VISITORS to Farm Fresh Fest at Wachusett Mountain in Princeton, Massachusetts, this weekend, will have a chance to taste some of these outstanding early season apples at the New England Apple Association booth. In addition to fresh apples, there will be apple baked goods and other apple treats. Executive Director Bar Lois Weeks and Senior Writer Russell Steven Powell will be on hand to talk about apples and the upcoming season, 10 a.m. to 5 p.m. Saturday, August 29, and Sunday, August 30. NEW ENGLAND expects a good apple crop in 2015. The U. S. Apple Association estimates the 2015 New England apple crop at 4.03 million 42-pound boxes, 18 percent higher than the region’s five-year average of 3.42 million-boxes. The crop is expected to be about 14 percent larger than 2014’s fresh harvest of 3.55 million boxes. Growing conditions were outstanding in early spring and summer, with good weather during the pollination period throughout the region, and little or no damage from frost. Parts of New England have been dry for the past month, notably areas of Connecticut and New Hampshire, and there has been scattered hail damage in some areas, but over all the crop is shaping up nicely. The timing of the New England apple harvest so far is on schedule, with early varieties like Akane, Ginger Gold, Pristine, Sansa, Williams’ Pride, and Zestar! already being picked. McIntosh, which accounts for about two-thirds of the crop, is expected to be available by Labor Day Weekend or soon thereafter in most areas. To find detailed listings of area orchards, visit the home page of the New England Apples website, and click on “Find an Apple Orchard.” Be sure to call ahead to see what is ready for picking. Most of the region’s orchards expect to have plenty of apples in a range of varieties and sizes. The 2015 United States apple crop is predicted to be 234.8 million boxes, about 14 percent smaller than 2014, according to USApple’s annual forecast. Leading the way is Washington state, with an estimated crop of 143 million boxes, about 18 percent smaller than a year ago. New York expects to harvest 26.2 million boxes, a 15 percent decrease from 2014, and Michigan will be slightly down from a year ago, at 24,000 million boxes. The 2015 national apple crop forecast is close to the five-year average of 236,008 million boxes. MANY HEIRLOOM APPLES have one or more flaws that keep them from mass cultivation. It may be that the variety is biennial, producing crops every other year, or is otherwise an unreliable “cropper.” The apples may be small or misshapen. Some otherwise fine apples do not make it to the marketplace because they do not store or ship well. Some apples simply fall out of fashion, notably the once popular russets, with their brown and copper colored skin and rough, sandpaper-like skin. The flavor of some heirloom varieties is too bland to compete with today’s commercial apples. The virtues of some apples do not translate well from their native climate, geography, and soil, losing distinctiveness when grown on a mass scale. 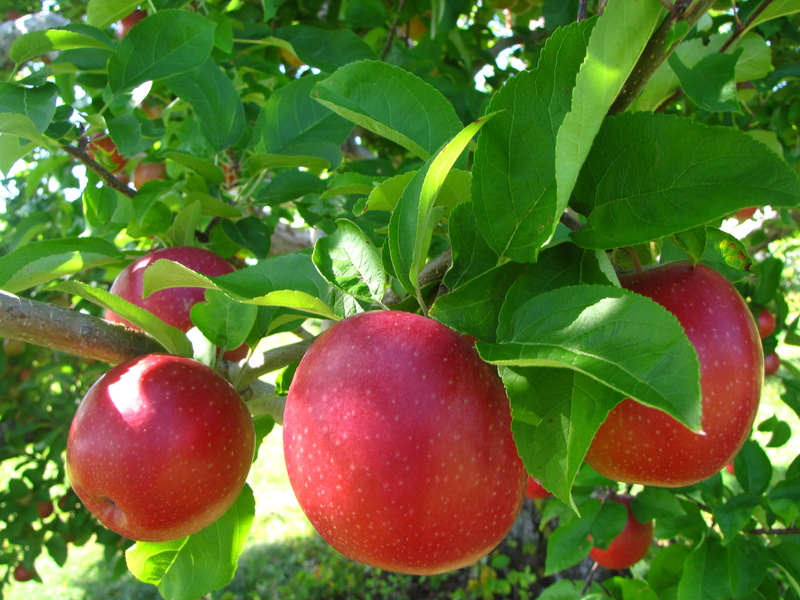 Some apples pose horticultural challenges, susceptible to certain pests and disease, dropping fruit before it is ripe, or vulnerable to extremes of weather. The owner of a commercial orchard cannot afford large plantings of rare or obscure apples that may be difficult to grow, fail to produce, lack distinction, or cannot compete in the marketplace. Yet on a small scale and in the right circumstances, many heirloom apples continue to flourish, broadening our experience of this incredibly diverse fruit. The apple is ancient, but constantly reinventing itself. Heirlooms are unique, edible relics from earlier times, exact replicas of the fruit from their original tree. The best of these are not just historically significant, they add a range distinctive colors, shapes, flavors, and textures to the eye and palette. It is safe to say that if an apple has been cultivated for 400 years, it must have something going for it. Such is the case with Gravenstein. Its limitations as a commercial apple are mostly horticultural, especially its vulnerability to extreme cold. Its obscure, old-fashioned name is a liability in today’s marketplace, and it does not store or ship as well as some varieties due to its thin skin. Yet Gravenstein is beautiful to behold and excellent for both cooking and fresh eating. It is a medium-sized apple with a blunt, conical shape, more barrel-like than the taller, slender Red Delicious. Gravenstein’s mix of reds and light greens blend together in an unusual watercolor wash. Its white flesh is crisp and juicy, and its flavor is lemony tart. Gravenstein inspires an almost cult-like devotion in some people, who consider it to be the best single variety for an apple pie. They will drive miles to get their hands on Gravensteins when they learn of a supply. 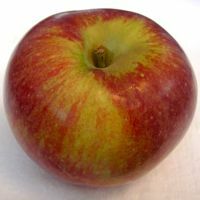 It is fruitless to argue with these enthusiasts, especially early in the season, since Gravensteins ripen before such leading pie-apple contenders as Cortland and McIntosh, Mutsu and Northern Spy. Gravenstein’s parentage and origin are unknown, but it is believed to have come from Germany or Italy, dating back to at least the 1600s. It has been popular in Denmark since it first arrived in the southern town of Gråsten in 1669, and it was named Denmark’s national apple in 2005. Gravenstein is the German name for Gråsten. 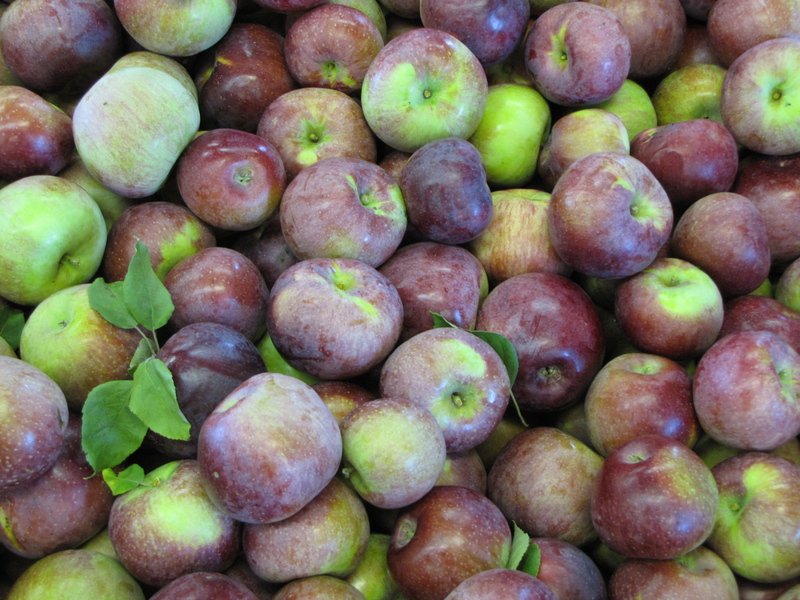 Gravenstein migrated to England in 1819, and to the United States in the 1820s, possibly as one of several apples imported here by the Massachusetts Horticultural Society. 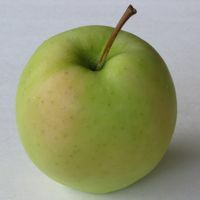 Gravenstein became popular in New England in the late 1800s, and it was the fifth most widely planted apple in the region as recently as 1930, trailing only Baldwin, McIntosh, Red Delicious, and Wealthy. Gravenstein’s decline was hastened by the same harsh winter in 1933-34 that wiped out most of New England’s Baldwin crop. Gravenstein remains a hard-to-find heirloom in New England today, but it is still grown widely in parts of Europe and the United States, especially in California. Red Gravenstein is a sport variety of Gravenstein, meaning that it resulted from a mutant limb rather than seed. As its name suggests, it is redder in color than its parents, and a little less tart. It was first cited in 1873. 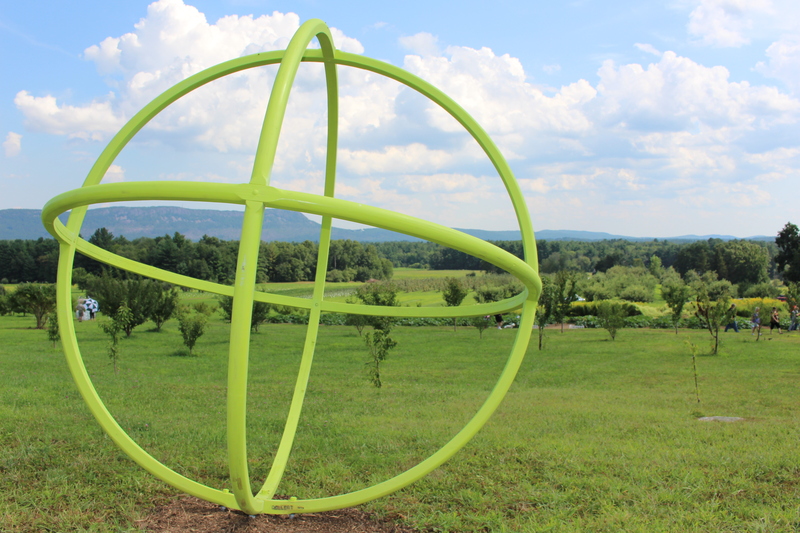 About 1,000 people attended the opening of the third Art In The Orchard, a biennial outdoor sculptural exhibit at Park Hill Orchard in Easthampton, Massachusetts, Saturday, August 15. 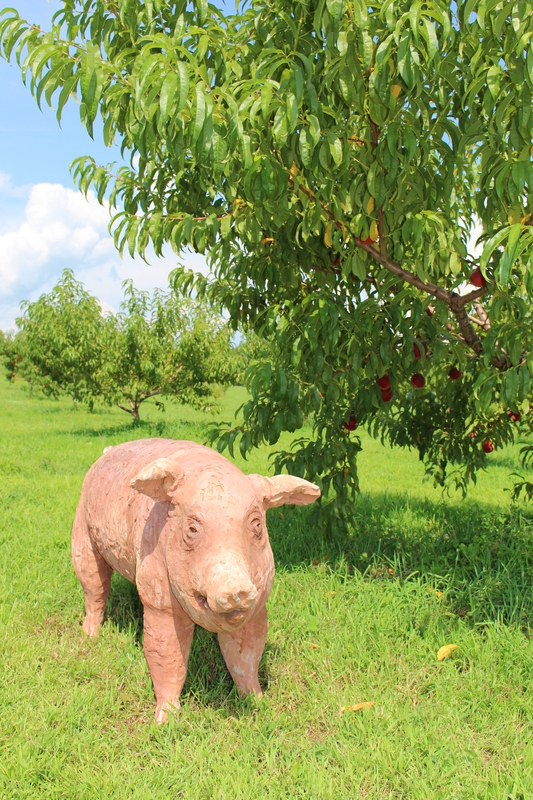 The walking orchard tour features the works of nearly 30 artists from around New England, whose sculptures are nestled throughout the farm, in and among the apple trees. 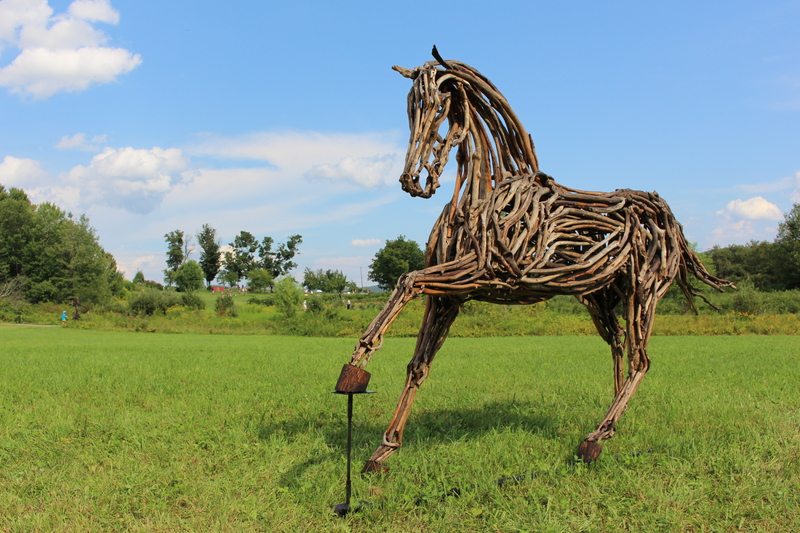 The sculptures will remain on view through October 15. It’s a beautiful day in the orchard! 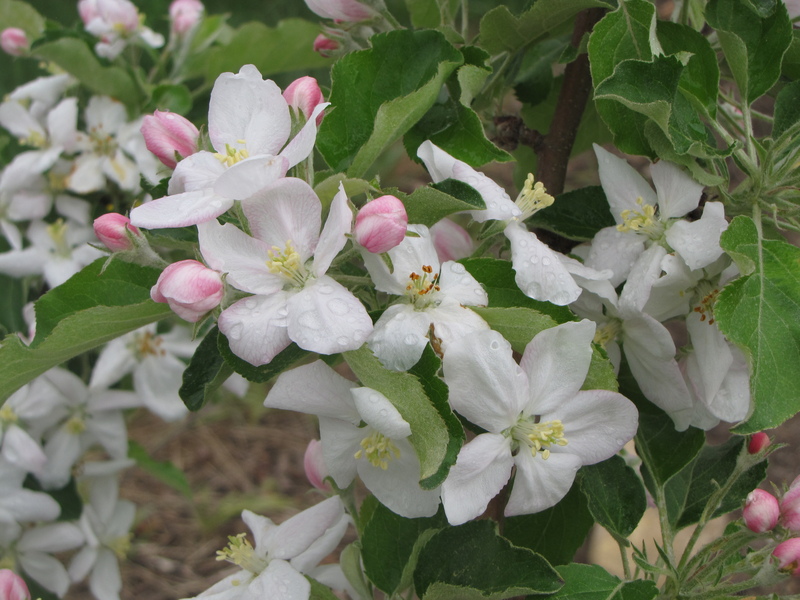 A little overnight moisture dampens the apple blossoms at Cold Spring Orchard, Belchertown, Massachusetts, May 12, 2015. Atkins Farms, Amherst, Massachusetts, May 12, 2015. 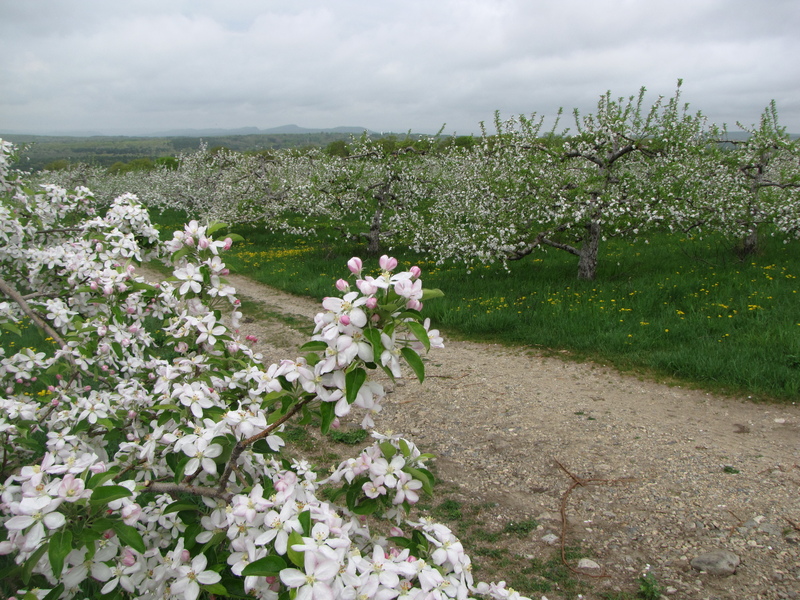 THE BLOSSOMS are peaking now at many New England orchards, and close up or from a distance, it is a spectacular sight. 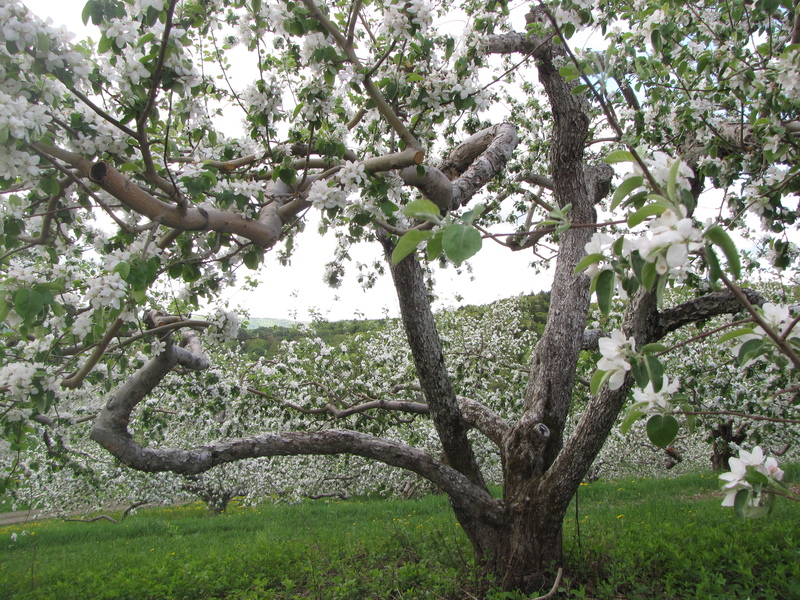 After a slow start, the bloom has advanced quickly in the recent stretch of summer-like weather — at Pine Hill Orchards in Colrain, Massachusetts, for examples, the blossoms were at “match-tip” stage May 9, and many trees were in peak bloom just five days later on May 13. 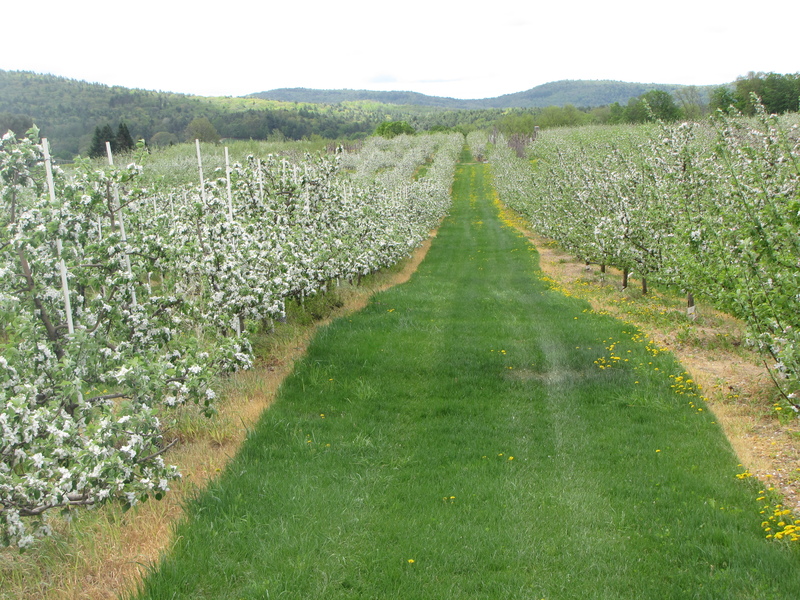 A little further north, McDougal Orchards in Springvale, Maine, reports that bloom is expected to peak there this weekend. The orchard in bloom is a beautiful sight, but the time for viewing it is short, especially in southern New England locations. If you have a chance to get out to see bloom in person, now is the time. To learn more about bloom and pollination, view the short video below, in which Frank Carlson of Carlson Orchards, Harvard, Massachusetts, explains why apple growers depend on honeybees during this critical stage. Even as a new season begins, crisp New England apples like these Cortlands from Green Mountain Orchards, Putney, Vermont, are still available throughout the region. 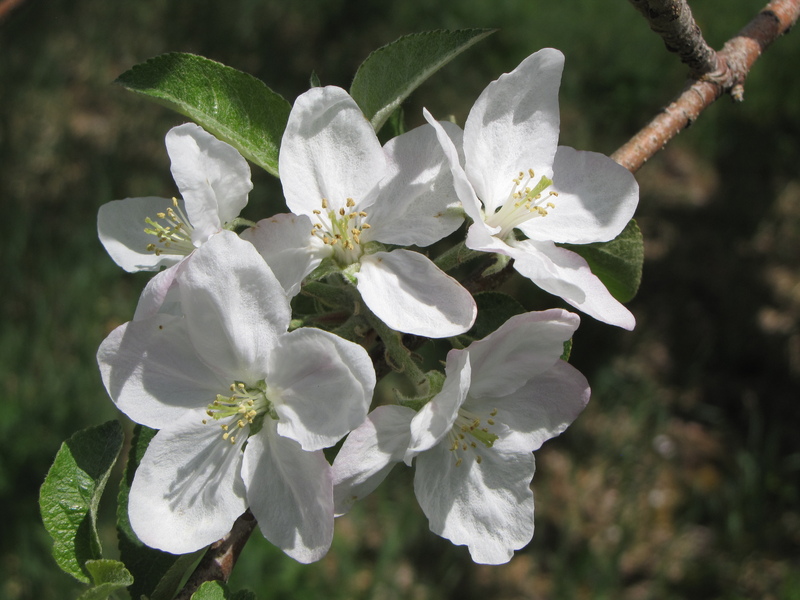 While the blossoms on the trees now will eventually develop into the 2015 apple crop, the good news for consumers is that there are still plenty of New England apples available from the 2014 crop. Fresh from sealed rooms in controlled-atmosphere (“CA”) storage, the apples are nearly as crisp and just as flavorful as the day they were picked. New England McIntosh, Cortland, and other varieties should be widely available for at least another month. Photographs by Russell Steven Powell. 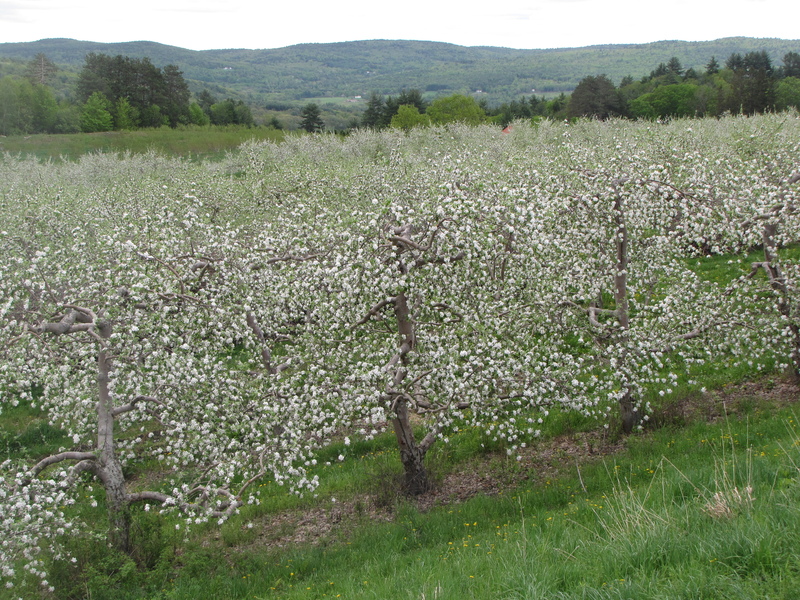 Green Mountain Orchards, Putney, Vermont, May 13, 2015. Alyson’s Orchard, Walpole, New Hampshire, May 13, 2015. 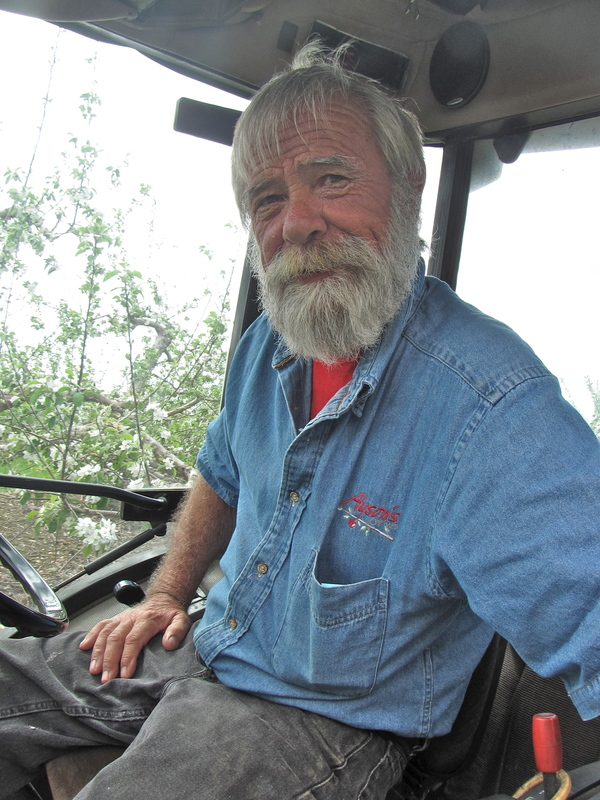 Orchard Manager Homer Dunn takes a brief break from mowing at Alyson’s Orchard, Walpole, New Hampshire. 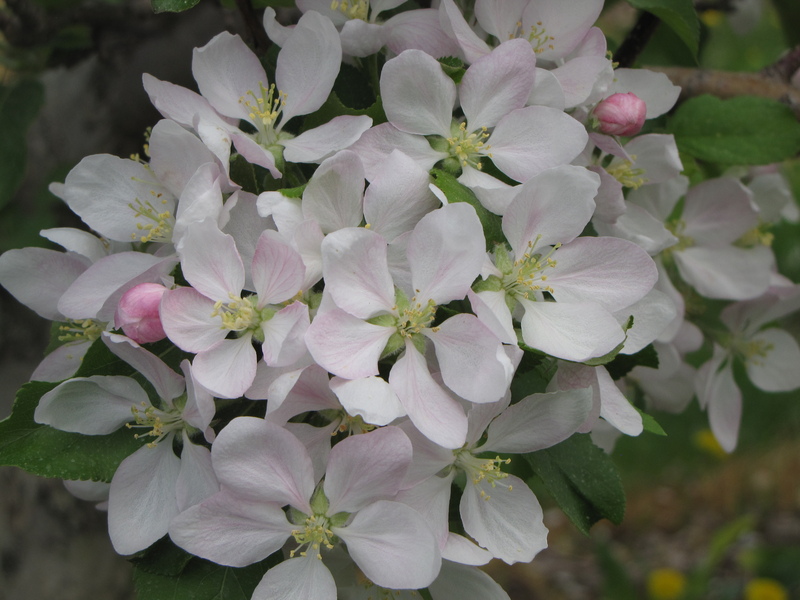 Blossoms were till at the “match-tip” stage at Pine Hill Orchards, Colrain, Massachusetts, May 9, 2015. 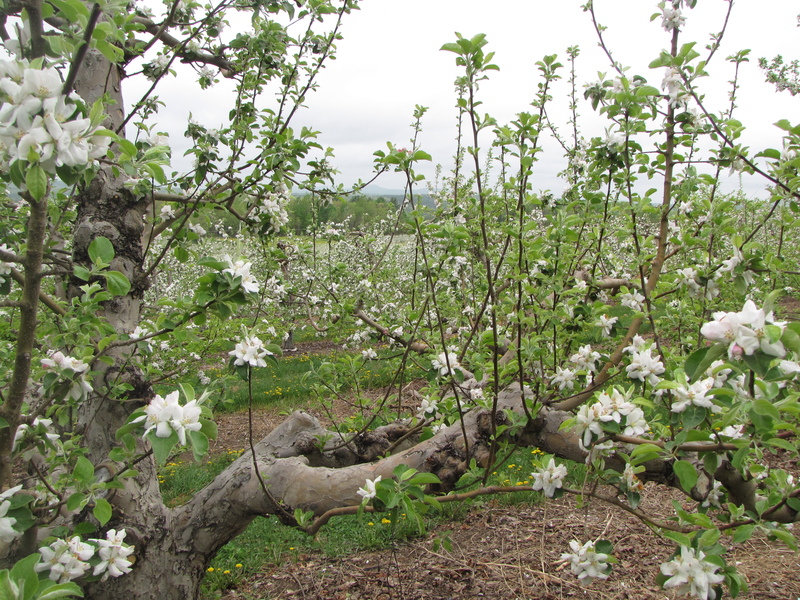 Just five days later, the blossoms had rapidly unfurled at Pine Hill Orchards, May 13, 2015. Bloom was already peaking on some trees at Pine Hill Orchards, May 13, 2015. 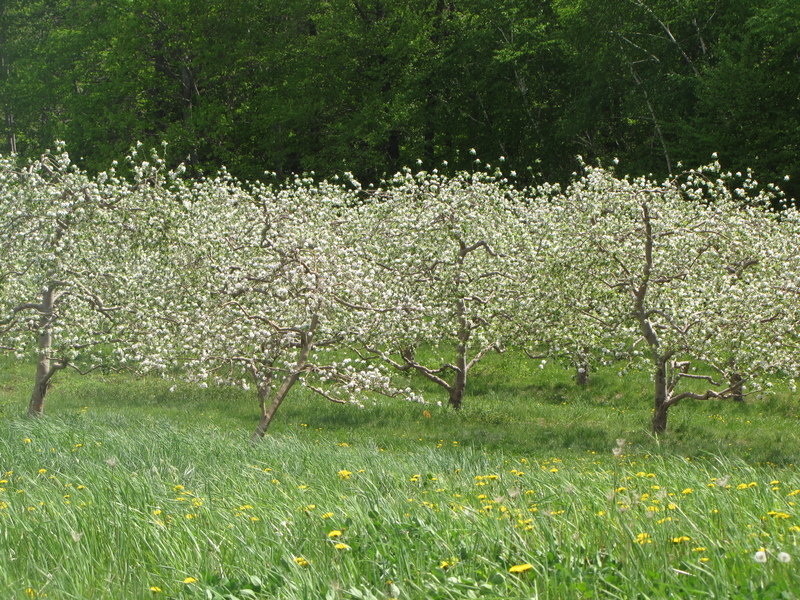 A sea of apple blossoms at Cold Spring Orchard, Belchertown, Massachusetts, May 12, 2015. THE LONG WINTER and cool spring may be frustrating to heat-starved New Englanders, but it is good news for the region’s apple growers. 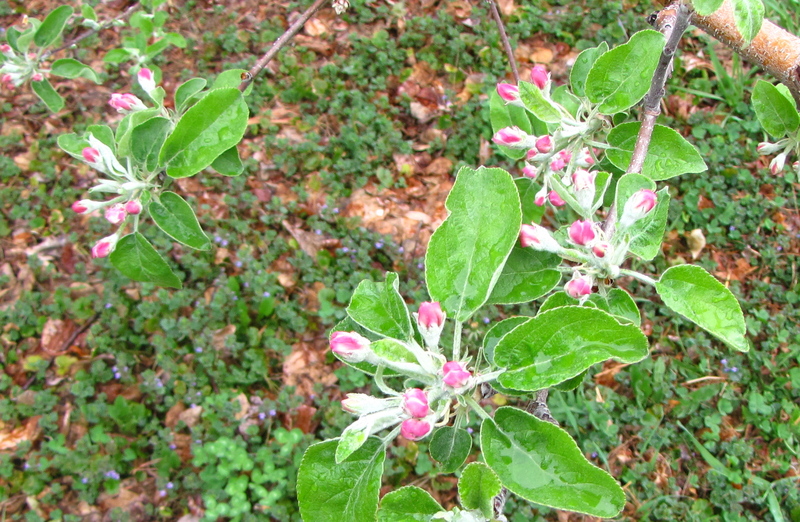 An early spring — as occurred in 2010 and 2012 — forces a premature bloom in the apple orchard, putting the delicate flowers and nascent apples at risk of frost damage for an extended period. This year is more normal, from an apple perspective. You can see the dramatic difference in our Spring 2015 McIntosh News, the quarterly newsletter of the New England Apple Association. A photograph taken at Belltown Hill Orchards in South Glastonbury, Connecticut, on April 5, 2012 (page 7), shows smudge pots beneath green grass and budded trees, a strategy for limiting frost damage. 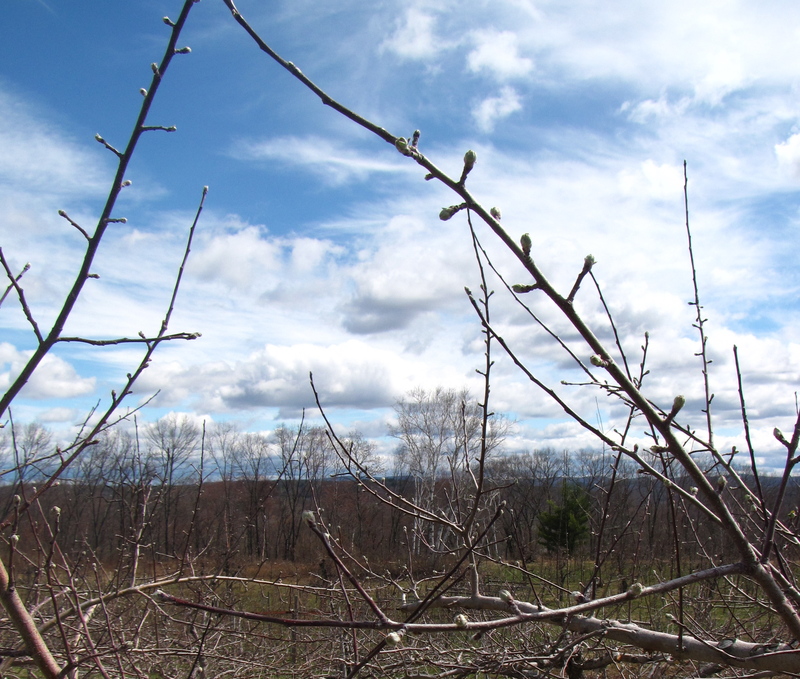 This spring, photographs from Clarkdale Fruit Farms in Deerfield, Massachusetts, (page 1) nearly three weeks later on April 23, shows green-tip buds just emerging. 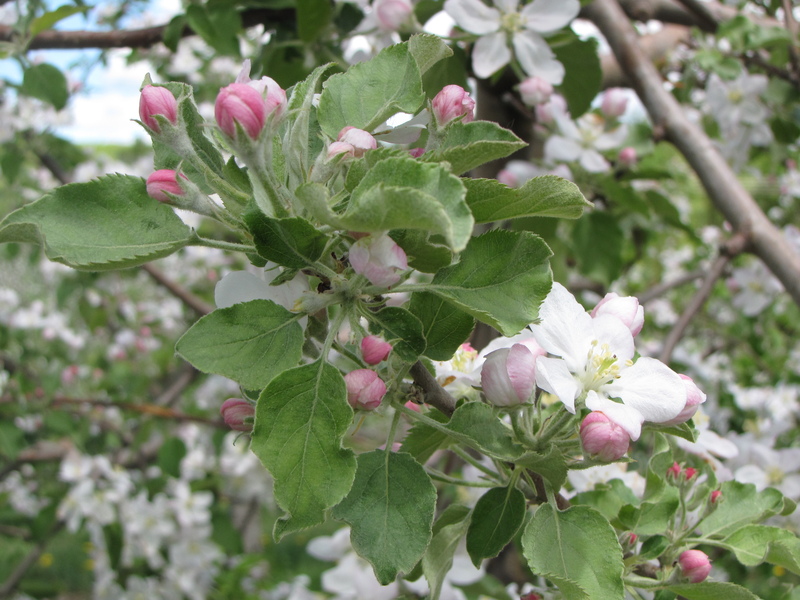 Bloom is expected around May 10 or later at most of the region’s apple orchards. Links to our three-part video series on integrated pest management (IPM), an entertaining and educational look at how New England apple growers deal with bugs, bacteria, and other orchard threats (pages 2-4). If you haven’t seen the series already, it is well worth it, and if you have already viewed them, they are well worth watching again at this critical time of year, when many orchard pests are re-emerging after a winter of dormancy. The engaging and informative programs star apple growers John and Pete Rogers and Greg Parzych of Rogers Orchards in Southington, Connecticut, and Chuck Souther of Apple Hill Farm in Concord, New Hampshire. We hope you enjoy the videos and newsletter, and we welcome your feedback and comments. The issue features a photo essay of the New England apples booth in the Massachusetts Building at the Eastern States Exposition (“The Big E”) by Executive Director Bar Lois Weeks. The 17-day fair attracted more than 1.5 million visitors this year in the middle of the fresh harvest, from September 12 through September 28. Check it out — you might recognize yourself or someone you know. In addition to people, the photographs show stellar examples of the fall apple crop, and serve as a reminder to ask for New England grown apples in your supermarket. They should be available in most places until late spring, at least.